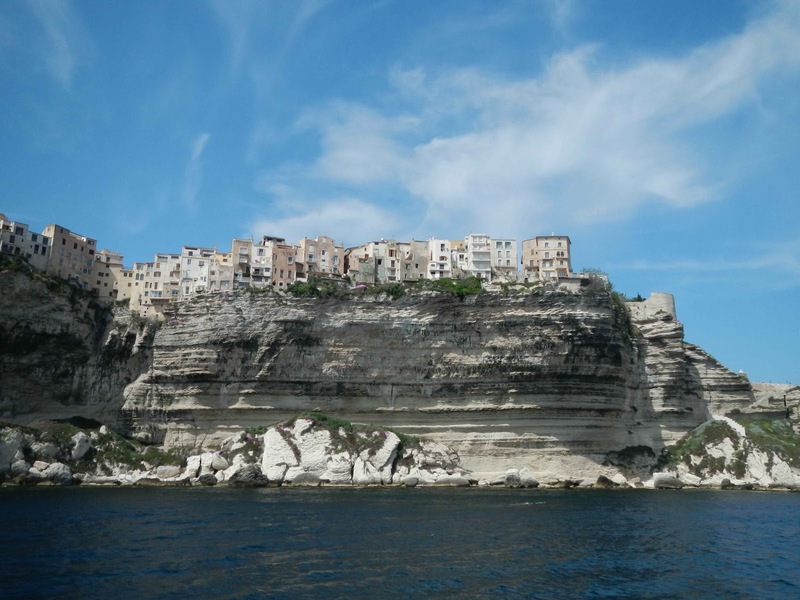 I have long wanted to see Bonifacio, that town perched perilously on the cliffs at the very south point of Corsica. By fortuitous planning, we were catching the ferry to Sardinia from Bonifacio, a mere 50 mins crossing, and decided to spend our time visiting the town instead of taking the long winding mountain lanes inland from Porticcio. Taking them would add several hours to our journey and we would have had time for nothing else. 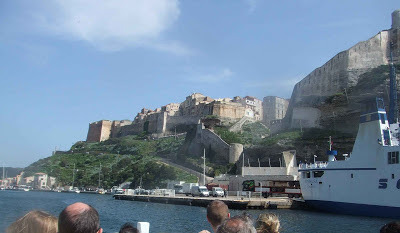 Motorbikes park for free in Bonifacio, which meant we could enjoy the sites without getting ripped off at the end of it. We took a boat trip out to see the town from the sea for the spectacular views of it perched on the cliffs (which we would also see from the ferry but not so well...). We had lovely weather for it, and the boat was packed. Lots of people had been stopped by the attractive girls plying boat trips along the marina. We were sat at the back of the front section which meant I could stand and take photos without bothering anyone. Cool. There's a little train that takes you to the top and drops you off for €10 (and brings you back down) but you can make exactly the same trip by car. The train shows you no more than you can see for nothing. Cars have to pay to park though. We had a party of extremely exuberant (post-lunch) retired fonctionnaires on our train who were loud and brash and thought themselves terribly funny the whole way up. Later, we were on that ferry which wasn't packed but there are 15 crossings per day! 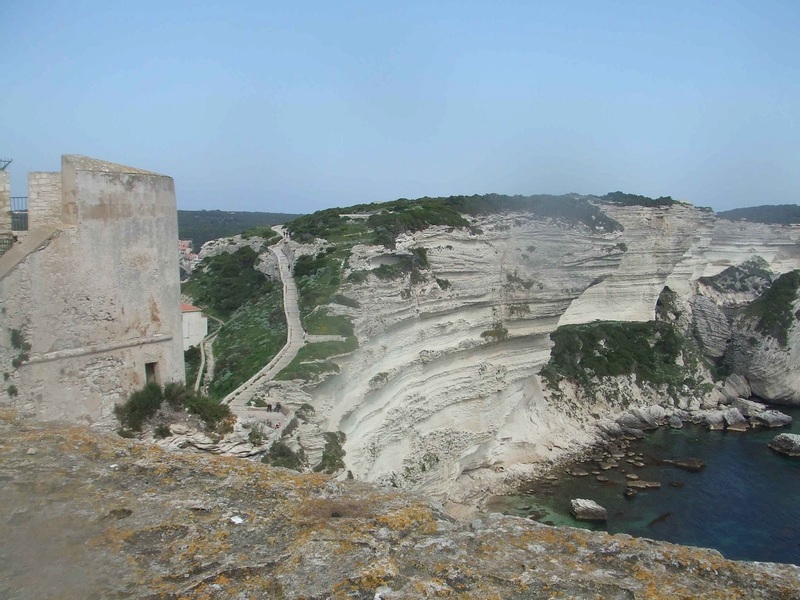 Napoleon lived in Bonifacio for a while. His name is on a plaque on a house in the middle somewhere. Peeking inside, the stairs up were terribly steep, the sort you haul yourself up. I was happy to spend the afternoon there. 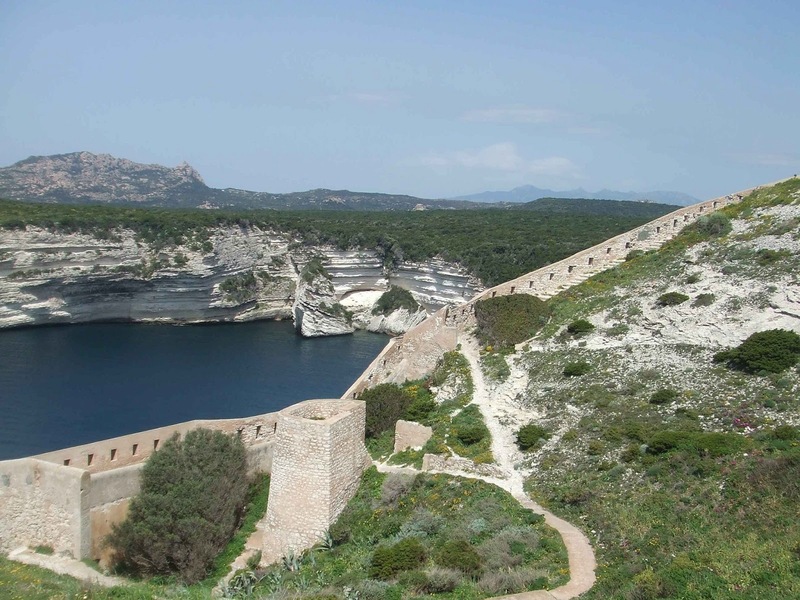 Even on a motorbike holiday, it's nice to stop and visit sometimes, and Bonifacio is certainly worth the detour. I think it must be hell on earth in the summer though with all the visitors. 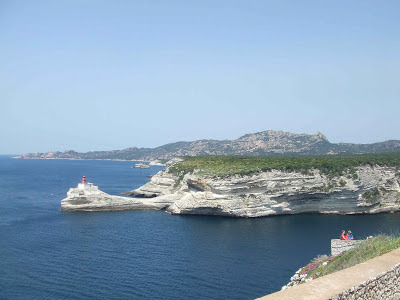 We got on a late afternoon ferry and arrived in St Teresa di Gallura, our port of arrival in Sardinia in a bit of a drizzle. It was also pretty chilly. Our hotel was marvellously placed in the centre, two minutes from the port, so we could pop into town to buy a map of Sardinia (much needed! ), notice that no one was about because of the cold, and that the place looked dead. How different it looked on our return a week or so later when the weather was good, the sun was out and the temperature balmy. 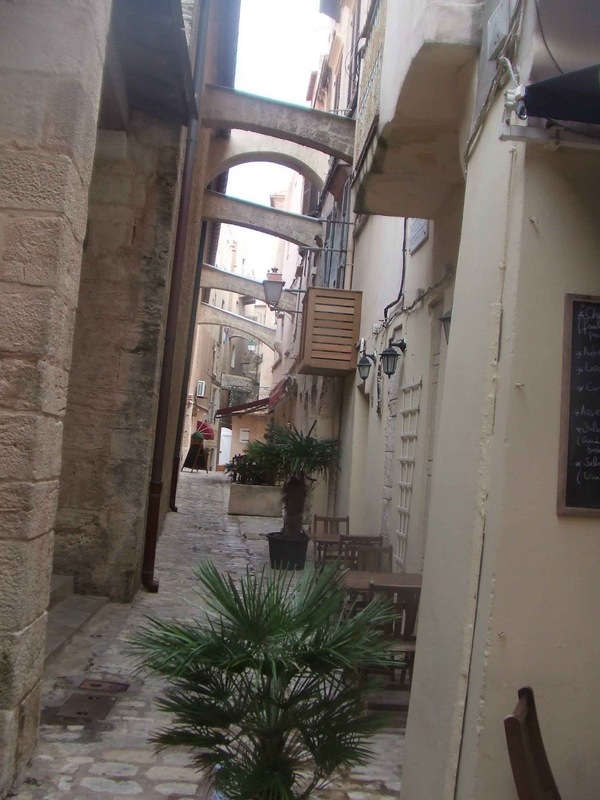 The piazza was alive with chatting folk, the bars had happy drinkers, and the shops had customers. Thanks Diane, yes we did have a great time. 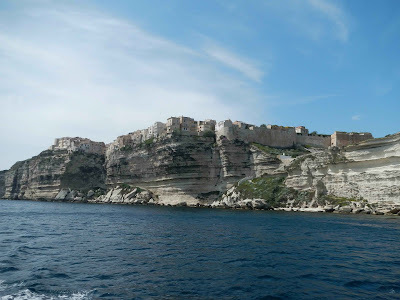 I was really pleased to have visited Bonifacio. 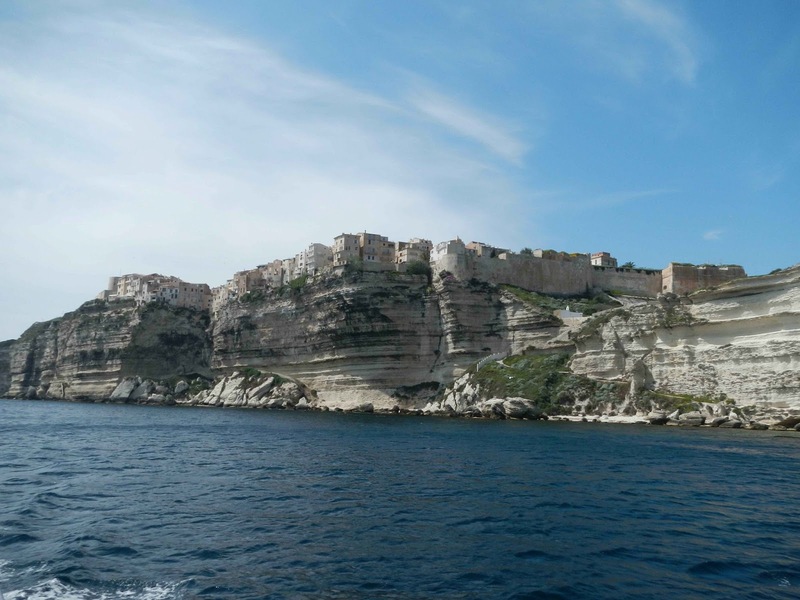 Bonifacio is stunning...those are super photographs. Thanks Fly. :) My DB took some of them with his superior camera. The vivid blue one of Bonifacio on the hill is his. This looks a gorgeous town - so pleased you got some great photos of it - and the fabulous rock strata. I'm sure we have made mistakes with ordering food in cafes- all these silly rules in different places with regard to how to order and pay. Silly. I know, you think wtf, put a sodding sign up if it's that important!!! The rock strata is just fab, isn't it? 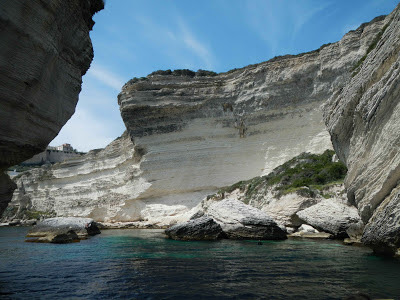 In one creek we visited on the boat we saw a beach where on one side there was pink granite and on the other side, about 30m away, limestone. It was the geological point at which the granite and limestone met. I took a photo but we were too far away to get a good pic. Beautiful pics- I want to go to Corsica when I grow up. Which isn't planned any time soon. Ah, French bar and restaurant owners. You've got to love them. Offer them money and they complain. Looking forward to th next chapter of your visit! 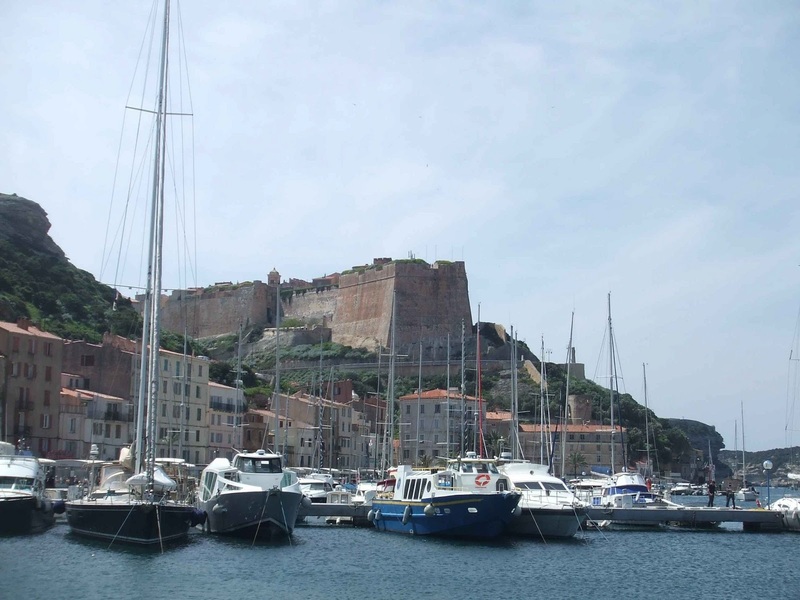 I saw a documentary about the foodie side of Corsica and it made me want to go there immediately. I can't remember who was doing what now of course. Looks gorgeous - fab photos! And I love the story about the sarnies and the bar owner. Clearly your psychic powers had let you down that day! Yes they had! I did suggest that it was impossible to know because there was no sign. She was mollified a bit later as her sarnies weren't sufficiently filling so we ordered a portion of chips and a coffee in the correct manner from the waitress. Had it not been very pleasant sitting in the sun on the terrace and the fact that we had time to kill before the boat trip, we would have left though. Hissy fit cow. 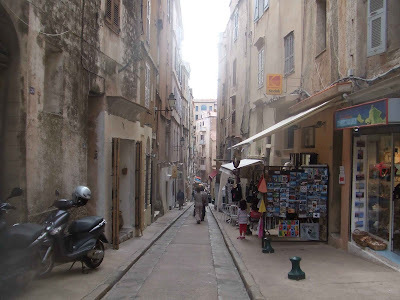 I went to Corsica a very long time ago. Your post reminded me that I totally need to go back! Amazing pictures, Sarah. Such a beautiful place, so calm and peaceful. The cliffs kind of remind me of those @Dover, England.